hVA celebrates the joys and hardships of love with multifaceted and meaningful lyrics. 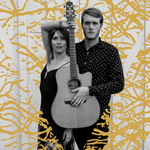 Using universal themes of love, life, living in ever-changing times, this new folk-duo touches on subjects felt by all. hVA, which is the Norwegian word for “what? !”, is the perfect description for the effortless creative partnership that Stephanie Croff & Kyle Reilly have found in one another. They are often noted for their incredibly tight vocal harmonies. Trained in classical guitar, Kyle weaves complimenting musical threads through the fabric of hVA’s repertoire. With experience from years spent in professional choirs, Stephanie creates powerful melodies and harmonies. When hVA performs live, audiences are often brought to silence. People have walked into venues from the street upon hearing their sound. Others have had smiling and tear-filled eyes of empathy for the heart-touching and intimate music created by hVA. With plenty of upcoming performances and opportunities to sing their new songs, hVA looks forward to sharing their unique take on modern folk music influenced by life on California’s central coast. © 2016 hVA Musikk Offisielle.